At the Autism&Uni Partner Meeting held in Amsterdam in March, we had as guest presenter Roy Houtkamp, a young man who represents the cutting edge of support for autistic university students in the Netherlands. For several years now, Roy has counseled autistic students professionally, and trained other professionals to provide similar support. As a teenager, Roy initiated a peer support group for middle school students with ASD. Having started his university career in IT, he soon switched to social studies, where he has clearly found his niche. While some may feel that this is unlikely for a person with an ASD diagnosis, Roy thrives in work that presents constant challenges and requires interaction with numerous people in changing situations. 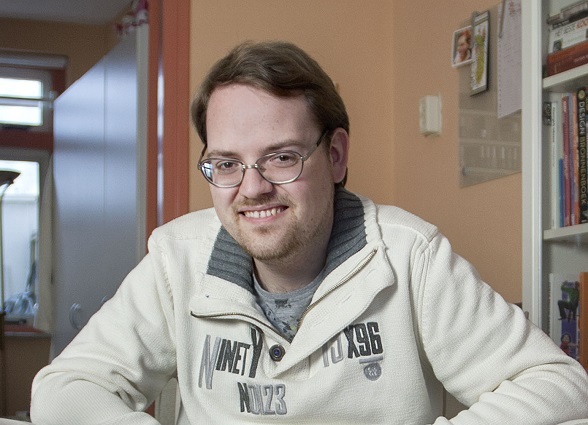 As an undergraduate, Roy ended up doing research involving large numbers of autistic students at the Fontys University of Applied Sciences, developing a self-assessment tool to serve their needs. At the moment, most of his time is taken up by lecturing. Handicap & Studie, a foundation that supports Dutch educational institutions to provide for a variety of disabilities, markets his services to numerous schools and universities. Roy feels that the current high demand for his expertise is part of a process that has unfolded over the past few years; technology has become increasingly central to the country’s economy, and people have become aware of the high proportion of autistic people in schools and businesses that revolve around technology. As some companies specifically recruit individuals on the autism spectrum to get the benefit of their unique cognitive strengths, and as HE institutions worry about gifted students dropping out, the technology sector is now leading the way in terms of adjustments and support. “I mainly get to coach individual students in the social sciences”, says Roy, “because in the technical fields they have it all arranged, they already have their own autism coaches”. The rapid progress that Roy had witnessed has not led to entirely equal or consistent provision for all. He recalls a figure of approximately 80 out of 3,000 technology students in the Eindhoven area, or nearly 2.7 per cent, having declared an ASD diagnosis. Currently the total number among the over 40,000 Fontys students is about 300, in line with a consistent 2-3% each year. All Fontys students who have declared their diagnosis have access to adjustments and support, but Roy believes there are still some going undiagnosed or undeclared and, as a result, without appropriate provision. In other universities, and in other parts of the country, awareness and expert support are often much harder to find. In Roy’s experience, this shows for example in the numbers of student counselors with knowledge of autism. Also, he feels that certain general characteristics of the Dutch system are challenging for the student on the autism spectrum. Even when the student is basically entitled to certain services and adjustments, acquiring the necessary funding can be hampered by complex hierarchies and rules concerning university budgets. The student is expected to take initiative in matters concerning adjustments, and may need the kind of self-advocacy skills that are typically not a strong point for these students – in Roy’s words, “you have to be able to argue your case”. The issues that Roy points out agree with the responses we received to the Autism&Uni survey from the Netherlands. The level of provision is relatively high, with large numbers of autistic students benefiting from currently available adjustments. The country has its own established forms of good practice, with research and practical experience to back them up. At the same time, it appears that there are some recognized gaps in the provision that could be addressed by introducing just the kind of tools our project is developing. They could become part of the toolkit especially for HE institutions that have relatively few autistic students. The structures are clearly in place to allow rapid dissemination and adoption of new practices. From the perspective of Autism&Uni, it will be fascinating to see if the Dutch will find ideas from other European countries useful, appealing, and compatible with their existing structures for supporting students with ASD.